Huawei Connect 2016 saw the signing of a Memorandum of Understanding (MOU) on cooperation with ABB, a global leader in robotics, and power and automation technologies. Under the MOU, the two parties will cooperate for the integration of Huawei LTE-based OneAir products and technologies into ABB robots and industrial automation solutions. The cooperation involves realization of remote wireless robotic monitoring, management, configuration, OM, Big Data application, and visualized intelligent manufacturing to jointly promote full industrial connectivity. The move is another step forward in bringing the Industrial Internet of Things (otherwise known as the Industrial internet and Industry 4.0) to greater scale and continuing to improve efficiencies in the industrial sector. Huawei and ABB will be at the forefront of the fourth industrial revolution, with real-time data and analytics benefitting all aspects of manufacturing. 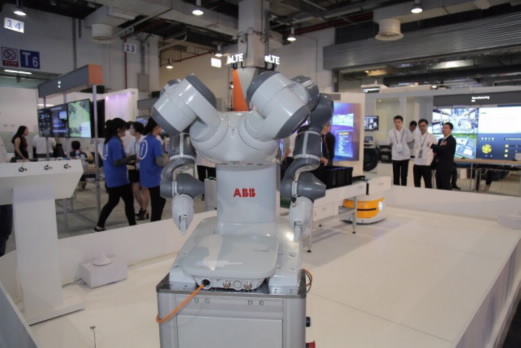 ABB Robotics is a leading supplier of industrial robots, and also provides robot software, peripheral equipment, modular manufacturing cells and services for tasks such as welding, handling, assembly, painting and finishing, picking, packing, palletizing and machine tending. ABB robotics key markets include automotive, plastics, metal fabrication, foundry, electronics, machine tools, pharmaceuticals, and food and beverage industries. ABB has installed more than 300,000 robots worldwide. The ability for industrial upgrade and technological development has lead to an increase in popularity of wireless technologies in the industrial sector. Robotic control now requires reliable wireless technology that supports efficient service operation, and the strong solutions focus helps manufacturers improve productivity, product quality and worker safety. LTE (4G) is an advanced and relatively mature mobile communication technology that is widely used throughout the world and has gained significant momentum in the telecom operator market. The technology has competitive advantages when compared to other wireless technologies and especially when applied on industrial private networks. This promotes the Huawei OneAir as an optimal solution to be applied in many industries. Huawei OneAir@Smart X was launched in 2016 and is a wireless industrial private network that provides full-service industry grade reliable mobile connections to support voice, video, data and IoT over one single network. The OneAir supports both licensed and unlicensed frequencies as well as having dedicated M2M connectivity to realize full spectrum combination giving enterprises optimal flexibility. Huawei OneAir is developed based on an LTE open architecture and the network also provides a customised software development kit (SDK) for connection to various industrial applications and realization of fully connected narrowband industrial IoT. The technology also provides wireless modules with standard interfaces and mobile processing capabilities allowing the product to be flexibly integrated by different industrial terminals and robots. Mr, Edward Deng, President of Huawei Wireless Network Solution, commented at the signing ceremony, “Reliable industrial wireless network are an important component during the automatic, digital and intelligent transformation of industries. We are positive about the prospect of incorporating LTE wireless communication technology into the industrial sector. Huawei, with its profound wireless R&D and innovation competencies will join hands with industrial leader ABB to develop E2E wireless products and solutions tailored to industrial characteristics and requirements. In the future, Huawei and ABB will fully leverage their respective strengths and extend cooperation and influence to multiple vertical industries. "It gives us great pleasure to sign a MOU on cooperation with Huawei to enhance our strong bond and partnership," said Mr. Li Gang, Vice President of ABB (China) Co., Ltd., Head of ABB China's Robotics Business Unit, and president of ABB Engineering (Shanghai) Co., Ltd. "Huawei is a global leader in communications, especially wireless communications. We are convinced that our cooperation and mutual strengths will help reinforce ABB's technological advantages in industrial robotics and automatic production to improve production efficiency and promote internal industrial manufacturing upgrades in enterprises."